Call Boat Owner Stephen 813-649-1368 813-391-6081. Description: A classic Trawler hull manufactured in Novi Scotia, and delivered to Lynn, MA where it participated in nearshore lobster fishing. It was abandoned in 1992. 20,000 of restorations were completed in 1993. It moved to Ruskin, FL in 1997. The hull was fiberglassed at Shell Point Marina. The house was extended for shelter from the sun and a second helm station was added. All new hydraulics were installed. Power is by Grey Marine Detroit 671 Diesel which was rebuilt in 1992. Manual transmission converted to remote shift with hydraulic ram. New StainlessSteel Davit and a HydroSlave Pot hauler for hauling anchor. Length 39'6"- Beam 13'10" - Draft 36". Rudder prop over keel so can be beached, or wiggle over sandbars. House extension ready to receive windows and aft sliding patio doors for live aboard. Head, 110 AC, solar charger, RV charger, 90Amp alternator. 20,000 worth of newer accessories, mooring chain, electronics, just too much to list here. I am disabled an unable to afford care for my "lobster yacht" any longer. Possibilities are conversion to a trawler yacht, a live aboard, a historical restoration, or a private partying boat for 30. All-time record aboard was 35 people Alblative bottom paint- no scraping Just brush on another coat. Just finished sandingprimingpainting interior, exterior port stern. Have paint for starboard exterior, but no to haul out. 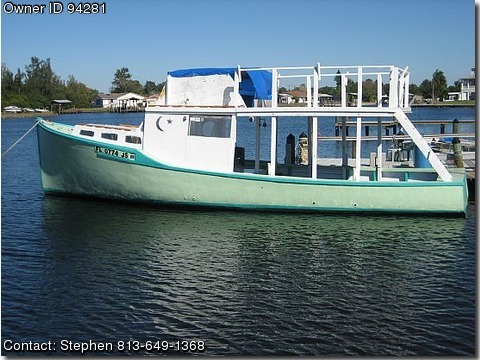 This is the ultimate all weather fishbooze cruise Vessel because the water cops rarely mess with “commercial” vessels. I’ve only been boarded twice in 20 years. Both times out of curiosity, because they had never seen a lobster boat before. This vessel is still in production in a fiberglass version, and is seen on the TV show “Wicked Tuna”. That vessel is named “Hard Merchandise”.